The Plymouth-Banjul 2006 and Amsterdam-Dakar 2005 Challenges both took place over the end of 2005 - beginning of 2006. Both Challenges involve driving cars across Europe and North Africa to Banjul in The Gambia, on a very limited budget, with absolutely no official support. Winning is not important - just getting there is the challenge. Several teams in both Challenges have helped Pageant in various ways, so we have created a number of pages to describe their exploits. This page contains a brief summary for each team. The Amsterdam-Dakar Challenge also finishes in Banjul with the official route starting at Ceuta, on the south side of the Straits of Gibraltar. The Amsterdam-Dakar Challenge website is mainly in Dutch, but if you don't read Dutch you can try the Babelfish translator to translate this into (sort of) English. There is a great video of previous rallies and driving through the desert on the Amsterdam-Dakar website. It really gives a good flavour of the whole event, with both Dutch and English cars featured. The Delft Dustbusters consisted of four aerospace engineering students at Delft University - Michiel van der Meulen, Mark Hoekstra, Steven Quaak and Egbert Pot. Their car was a Volvo 740 saloon with a 2.3 litre engine, acquired just before departure when their Renault van was declared a total loss! They have a Pageant team page and their own website, with a photo gallery. 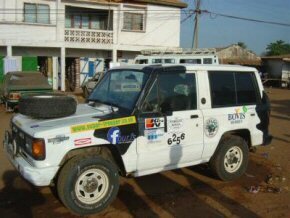 They reached Banjul on 24 November 2005. On their return to the Netherlands, they made a donation of 1500 Euros to Pageant. * These pages are in Dutch. We recommend you use Babelfish to translate them into English. The Plymouth-Banjul Challenge started in 2003, when it was called the Plymouth-Dakar Challenge. The 2006 Challenge comprised 205 teams, divided into four groups. Group 1 left the UK on 19 December 2005, Group 2 left on 26 December and Group 3 left on 29 December. Group 4 left on 9 February 2006. You can find out more about the 2006 Challenge on the Plymouth-Banjul Challenge 2006 website, and also look at the route they took. At the end of the Challenge, the cars which made it to The Gambia were sold off in a series of auctions. Considering the adverse conditions en-route, and the condition of some of the cars, we are amazed to learn that 106 cars were auctioned, raising a total of 4,504,500 Dalasis (£88,649). This was distributed between ASSET (Association of Small Scale Enterprises in Tourism) and GNOC (The Gambia National Olympic Committee). The two teams highlighted below raised a substantial amount for Pageant in sponsorship, and provided us with extensive information and pictures which we have published on their Pageant team pages. Team Shap Ahoy, in Group 1, consisted of Nick Capron and Tim Lovatt, both from Cumbria. Their car was a 1996 Toyota Starlet, which they named Bill. The picture shows it en-route to The Gambia in the Sahara Desert. The Pageant Shap Ahoy team pages contain a full description of their journey, with lots of pictures. Tim and Nick raised a staggering total of £4572.55 for Pageant, and this has gone towards the refurbishment of Saloum Nursery. The sale of their Toyota raised 86,000 Dalasis, equivalent to £1692, which was then donated to ASSET and the GNOC in The Gambia. Team Super Trooper, in Group 2, consisted of Rupert Williams and Paul Clifford, from Malmesbury in Wiltshire. Their car, a 1989 Isuzu Trooper, is shown here at the end of the Challenge. The Pageant Super Trooper page briefly describes their preparations and journey, Super Trooper's own website gives a lot more detail and there are lots of pictures in their photo album. Their Wine and Cheese evening in Malmesbury raised over £1000, which is being used to help complete three new classrooms at Bakalarr. They also took to Bakalarr lots of T-shirts and ex-Slough Football Team kit, as well as countless pencils, pens, chalk and textbooks. The sale of the car raised 36,000 Dalasis (£708) for ASSET and GNOC. Two other teams expressed their interest in helping Pageant. Unfortunately, they didn't give us much information about their preparations and journeys so we have now removed their very brief team pages from this website. GingerBeard (T6460) consisted of the daughter and father team of Briony and Peter Dumenil. Their car was a beige 1986 Citroen C15 van, affectionately called 'the Camel'. They had hoped to raise sponsorship for Pageant, but unfortunately time ran out. A surprise bonus was that several other teams decided to donate money and items to Pageant projects in The Gambia. Some teams learnt about Pageant from one of 'our' teams. The Challenge organisers in Banjul also advised teams with items to donate and no particular recipient in mind to contact Pageant's agent Kemo. Pageant would like to thank all these teams. Howells Enterprises (T6104) travelled to The Gambia in the old Ringwood School minibus. (More on the Ringwood School website - it's about 2/3 of the way down the page.) They asked Pageant to assist in distributing the large amount of supplies they took out with them and the huge quantity of football kit they supplied went to the up-country schools football tournament at Janjanbureh (Georgetown) - the first time these youngsters have had proper kit for this event. Organic Mechanics (T6118) Steve Hall and Pat Mann from Bognor drove a 1991 Opel Omega, and were in the same convoy as Shap Ahoy. They have decided to donate some of the money they collected from their sponsors to Pageant. See also the Organic Mechanics own website. Piston Broke Again (T6200) went to Bakalarr school with Super Trooper, and donated a picnic table and several other items. However, the large patch of oil left by their Land Rover should not be viewed as a donation. Janners on Tour (T6253) also went to Bakalarr with Super Trooper and donated at least 15 footballs, valves to inflate them and other items. Idiots Abroad (T6317) - Emily phoned Pippa from Banjul, and was put in contact with Kemo to distribute the many things they brought with them. Pages not provided by Pageant may be deleted without us knowing. Please tell us if any of these links fail to work.